"To celebrate the 25th anniversary of my beginnings in art, I'm publishing a series of limited edition silkscreen prints based on some of my favourite works from the past." 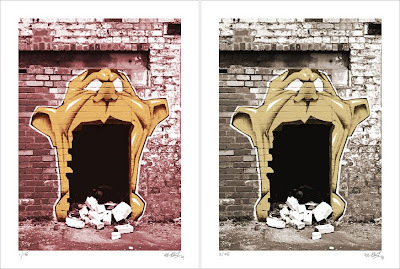 The first print is the series is "Urban Decay" pictured above and is based on a piece of his from 2001. It is available in two colour ways , brown coffee (edition 45) and red gold (edition 15). Both edition are available now on his online shop. The prints have been handscreened by SHOK-01 himself on his homemade screenprinting bed. You can view some of the progress shots of the process on his flickr.